I enjoy making spectacular dishes but try making them as healthy as I can. The key, in my opinion, is using the freshest ingredients you can find, from the earth and sea. I have found that my family rarely feels stuffed after these meals, and in fact, quite refreshed, that is unless they overindulge. If I’m stumped what to serve for dinner and don’t feel like fussing, creating a dish with a salsa is always a winner! While many salsas are made with fruit, this one is savory and delicious! In fact, it’s perfect on its own, as a condiment, a side dish, with chicken, beef or fish, as I served it here. Packed with vitamins, minerals and antioxidants in addition to the added protein, this meal will satisfy even your hungriest dinner guest. I think you’ll agree the flavor is spectacular! So if you’re still on the fence what to serve this holiday weekend, try this recipe with your favorite protein. I know you’ll enjoy it! Lightly rub oil or non-stick spray over the corn, peppers, onion and tomatoes. With your grill on medium heat place vegetables onto grate, turning corn every 4-5 minutes until brown on all sides. Flip peppers, and onions after 5 minutes removing peppers after skins have charred. Turn tomatoes, and leave on grate just long enough for skin to start peeling away from the "x". When corn, peppers, onions and tomatoes are grilled, remove from heat and set aside to cool. In a large heavy sauté pan, holding each ear of corn upright, cut off the kernels with a sharp knife allowing them to fall into the pan. Remove skins from the peppers (discarding), and dice into 1/4-inch pieces along with onions, and place in pan. Peel skin from the tomatoes, slice into quarters to remove the seeds, then dice into 1/4-inch pieces adding to pan, along with chopped sun-dried tomatoes. Set aside. Rinse fish and pat dry with paper towels. Lightly oil fish on both sides and season with salt and pepper, if desired. 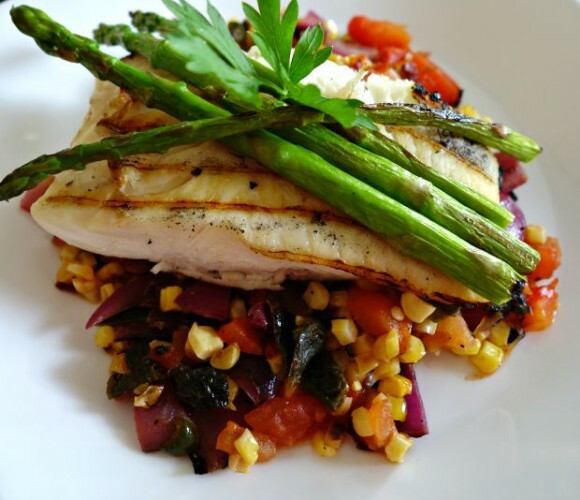 Add halibut to grill, grilling approximately 4-5 minutes per side. Fish will be done when the tip of a knife inserted in the middle causes it to flake. (The color will go from translucent to white). Just prior to removing the fish from the grill place your heavy sauté pan with vegetables on the stove. Turn the heat on medium, adding in the remaining teaspoon of oil from the sun-dried tomatoes, and red wine vinegar. Stir the mixture until heated through. Remove from heat, and add lime juice. Taste and adjust seasoning. 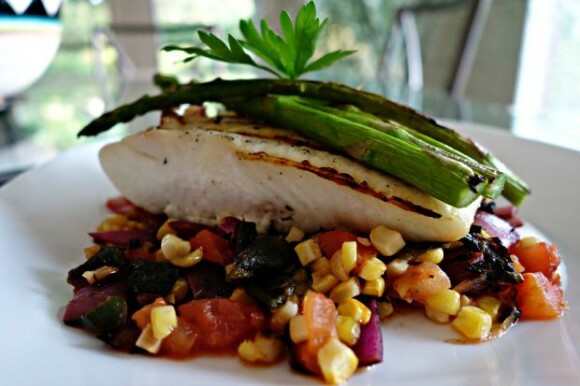 Make a bed of salsa on 4 warmed plates, and place Halibut or fish of choice on top of each. Serve immediately. This is my kind of dinner, it looks wonderful Vicki, like some fine restaurant! I tend to make fruit salsas to serve with fish, but your corn salsa is incredibly tempting! I know I’d love it. It’s delicious, I could just eat it on its own. I’m with Liz — I do many more fruit salsas with fish, but corn salsa would be terrific too. Really nice — thanks. I think most of us tend to do fruit salsa or those with just beans and peppers. This one has a hearty flavor. I think you’ll like it if you give it a try. The halibut looks so meaty and beautiful. Awesome presentation too, Vicki. You definitely have made a spectacular dish here!! Not only is it just downright gorgeous, it’s over the top healthy. 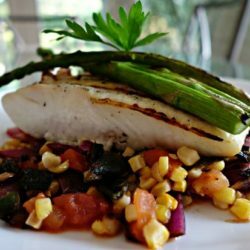 We love halibut and can actually find it here, so I’d love to give this a go. Thanks for sharing Vicki and hope you and your family have had a great Labor Day weekend. I love halibut and this is such a delicious way to serve it. I absolutely love the veggie salsa with Fish. My hubby, a big fan of fish almost eats it everyday. This sounds like something he would enjoy. The crust looks amazing.